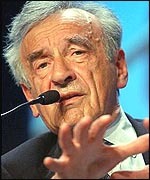 Elie Wiesel, survivor; author of book: "Night", about his horrible sufferings at the hands of the Nazis. 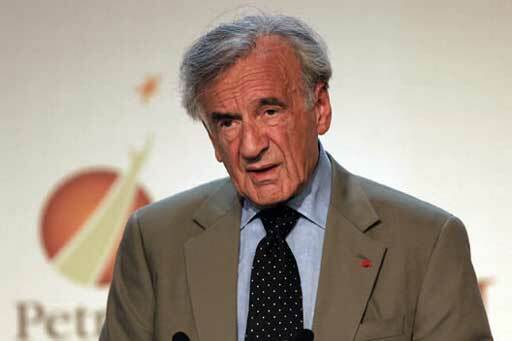 Elie Wiesel to receive first U.S. Holocaust Museum Award: and indeed, where would the legends be without him? Christopher Hitchens on Wiesel in The Nation, Feb 2001: "Is there a more contemptible poseur and windbag"
Was Wiesel ever at Buchenwald camp? 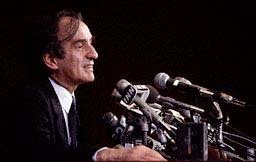 Oct 2002: The academic boycott widens (or narrows): The Daily Northwestern (Chicago University): "[Elie] Wiesel also urged students to boycott NU electrical and computer engineering Prof. Arthur Butz, a Holocaust revisionist." Prof. Arthur R. Butz has posted useful comments on Wiesel on his website: Wiesel's book Night has been chosen for the "One Book, One Chicago" program although even some non-revisionists concede that the book is a novel and raises therefore issues similar to those associated with the notorious Auschwitz-survivor impostor "Binjamin Wilkomirski".